He's fearless, scareless, a little too careless. Dynomutt: He's a go-go dog person! 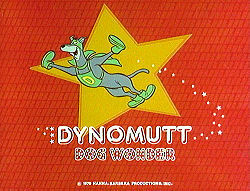 Dynomutt is a friendly "Robot Dog", voiced by Frank Welker, with special robotic superpowers — but his "carelessness" is only slightly better than that of Inspector Gadget (whom he predated by 7 years; 6 if one counts the 1982 pilot). He and his straight-arrow Superhero master, the Blue Falcon (no relation), fought crime and patrolled their city in the Falconcar, which usually flew but sometimes hovered closer to the ground. Like Batman, the Blue Falcon had a variety of tools in his Utility Belt. He addressed Dynomutt as "Dog Wonder" or "Dog Blunder" as circumstances warranted. Circumstances could warrant either, frequently. Dynomutt was usually the one to fix the messes and catch the villains, but he always managed to make things worse first. This dynamic duo debuted in 1976 on ABC as part of The Scooby Doo/Dynomutt Hour. They were Scooby's teammates in the Laff-A-Lympics. Affectionate Parody: Let's just say the show didn't take itself seriously. Or maybe Adam West's Batman. Crossover: With Scooby Doo and Dexter's Laboratory, and Dynomutt and Blue Falcon appear in Harvey Birdman, Attorney at Law and Johnny Bravo. Darker and Edgier: Well, sort of. Years ago the Cartoon Network Web site briefly had a serial animated webcomic starring Dynomutt and Blue Falcon, featuring a much darker plot than those seen on the TV show: Dynomutt being destroyed then rebuilt as an evil, vicious brute by the villain Hijinx. Though, as Hijinx himself ruefully admitted, Dynomutt's tendency to malfunction in a spectacularly zany manner was still omnipresent. What about Gary Owens (announcer for Laugh-In and original non-talk-show voice of Space Ghost) as the Blue Falcon? He even reprised the role in the Dexter's Laboratory crossover! An Ice Suit: Mr. Cool. Punny Name: The "Queen Hornet"
"Blue Falcon...(and Dog Wonder) AWAAAAAAAAYY!!!" This page was last edited on 7 August 2014, at 16:14.